There is a lot of cool stuff going on with this card. Those activated abilities make her a decent Orzhov knockoff of Morphling (or Torchling, Aetherling, Brightling), very nearly as awkward to block or evade in combat. Afterlife means that your answer is not necessarily an actual answer, especially when Orzhov decks have so much use, on average, for death triggers and spirit tokens. On top of that, four mana is a very aggressive cost for so much value. I wouldn’t be at all surprised to see this angel appear in competitivre decks at some point. Seraph of the Scales is definitely mythic for its power level. A four-mana 4/3 with flying is already a good rate of return for both of its colors…but it can conditionally get vigilance and deathtouch, making it a more formidable force. It can attack without leaving you exposed, and it can guarantee at least a trade against anything that isn’t indestructible. For that alone, it’s a massive headache for any deck that doesn’t run kill spells. But even if you do kill it, it leaves behind two Spirits to further wreak havoc. The value of afterlife is that you’re almost always getting something out of your opponent killing it, and afterlife 2 is a good way to keep pushing value through. There are only a handful of ways to make sure Seraph of the Scales doesn’t get its afterlife trigger off (Lava Coil comes to mind), and it bears noting that Orzhov has plenty of synergies with tokens in this set (hi, Teysa Karlov). 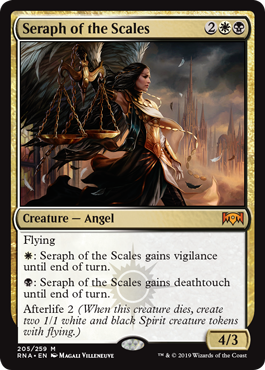 Seraph of the Scales will probably see a good bit of play, though she’s maybe not the reason Orzhov will be strong. But she’s a house in Limited, if nothing else.